Regional events and destinations need to stop using the unwritten event formula (food trucks, wine, farmer’s markets, music and a street parade) and start being creative and entrepreneurial in their event creation and delivery. Take time to visit other events around the world and gain insights and ideas on how you can create an event that is unique to your destination and community. Regional councils need to be strategic in how they integrate events into their tourism strategies and destination management plans. It is important that all areas of council (roads and maintenance, facilities management, planning, etc) understand and embrace the power of events and work proactively to attract and support major festivals and events. There is nothing more powerful than listening to your visitors and attendees. What do they want? What are the trends they are following? How do they want the event to grow and improve? The biggest thing you can do wrong is program an event with all the entertainment that you or the event committee like! It’s not about you, sorry! Work with partners very early in the planning stages to gain the best leverage and support e.g. with travel agents, your RTO, corporate partners, Council, etc. Do not work in a silo and expect partners to come to you; it is about building these networks and relationships very early and nurturing them throughout the entire planning process. We're booking tickets to Dark Mofo In Tasmania now! Use big gestures + think big! We are in the connection business, sharing ourselves; and in the mind-altering game of future-building. Connection is between us and within us. At a great event, you end up knowing something you didn’t know before: you enter a more diverse world. When we share, feel-good hormones flood us, triggering mirror neurons; emotions are contagious. Destinations need great events that are completely immersed in the destination and the people: locals doing what they do best. People will not travel for manufactured events! They must authentically reflect the locals. 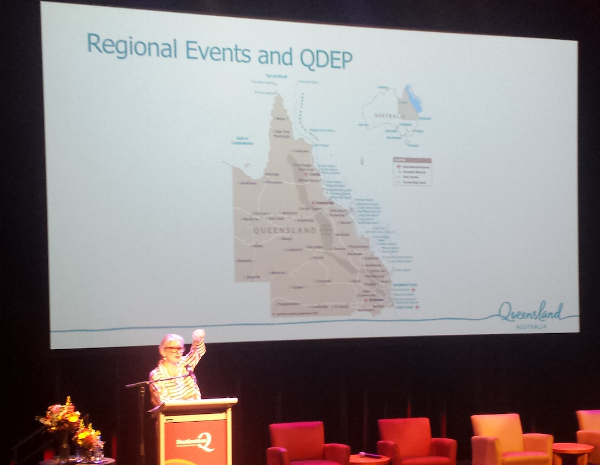 The presence of events folks is needed at DestinationQ’s annual convention 9-10 November in Brisbane (coinciding with the annual Queensland Tourism Awards gala ceremony). Glenn provided really clear instructions on how events can measure their economic impact, what to measure, as well as the top mistakes events make in gathering data. We’ll detail these in an upcoming blog article. The economic impact of an event does not include spending by locals - it's only about measuring new money coming into the destination. The net event organiser impact economically on the community can be improved by purchasing goods and services from the economy, and growing income from out of region. Work together in partnerships to build the event brand and the destination brand. Tourism is really everyone’s business because events do a great job of dispersing their export income across many kinds of local industries. Event objectives: should you chase more and more visitors or chase yield: those who spend more and stay longer? This depends on where your event is in its lifecycle (An event might grow numbers in the beginning and then chase yield). An event has to provide a minimum quality of transport, accessibility, visitor services, signage and amenities, and provide quality experiential elements: entertainment, innovation, unique food experiences, use of tech, etc. Ensure you are working on improving visitor services. Creating emotion leads to loyalty which leads to advocacy, so create opportunities for visitors to feel connected to family/friends/locals, to feel entertained/excited/inspired/special, and for escapism. Create local ambassadors for your event because visitor connection with the local community is critical - visitors want to live like locals and feel connected! 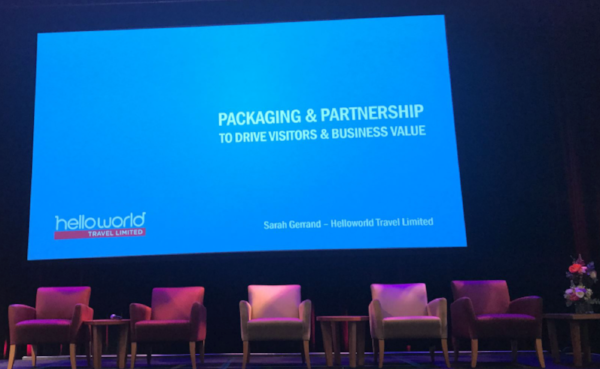 Partnering with a travel agency can expand the reach of your event - it's another great distribution channel that also increases the length of stay and yield of visitors. Travel agencies are frequently overlooked as event partners but they have contacts with end consumers. Travel agencies can work through white label websites. This is a ticketing page on your website with your event's branding, so consumers seamlessly recognise it as the event's ticket page, but the sales actually take place with the travel agency. International visitors book early, so have this page on your website early (and add merchandise packs too!). Why partner with travel agencies? Events need to start working with travel partners early to get the best value! Event packages need to be in market at least 8-10 months prior to events. How will your customer enjoy the journey? Do what you do to provide for your audience. For Ironman they have packages for participants and their supporters. What needs or wants does each group have and how can you improve their experience? For conference breaks, attendees got a chance to stretch their legs on insightful tours of Australia’s largest outdoor art gallery: Toowoomba's First Coat, produced during a series of mural festivals. State what kind of sponsor you are looking for e.g. a business that is a high achiever with a strong brand and affection for our town. Trademarking can protect your brand from use that's unaligned with the brand. The Carnival brand is so powerful everyone wants to leverage it – a garage sale and a business selling toilets used the logo during festival week (yes, that really happened!). What do they want? e.g. branding or consumer engagement? Can the event service that? Buy locally. Council has a policy of providing in-kind support rather than funding because that way they ensure services are all provided by local businesses. 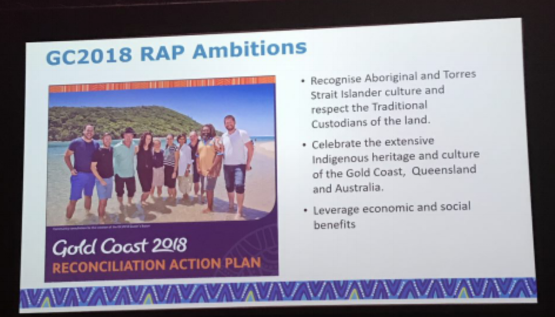 For the first time ever in the world, the Commonwealth Games has created a Reconciliation Action Plan to effectively engage with and include the Indigenous community and offer long-term legacy benefits to the community from the games. For the first time ever in Australia a major event has created a Reconciliation Action Plan. Stay tuned for an upcoming blog article specifically about the Commonwealth Games RAP and the significance of RAPs for the Australian events industry (plus takeaways for smaller events). 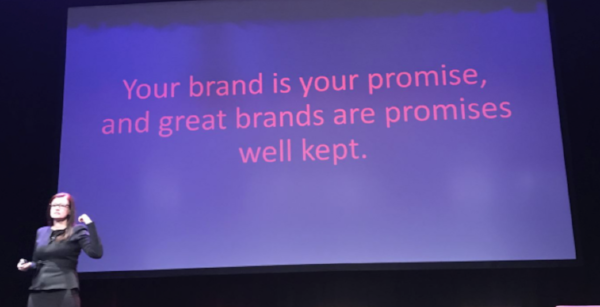 You’ve got to keep delivering your event on brand, remaining true to who you are and what you are trying to achieve. Consider dark or controversial ideas instead of ticking the festival element boxes of parade, market, food, music, etc: Can you reinvent the festival format? Accept criticism and failure: it’s meant to help you. Acceptance leads to community respect. Consider adding a participatory ritual. Each year Dark Mofo creates a paper mache monster. As it is built the community writes their fears on paper and adds them to its belly. The beast is paraded down a street then burned; the community has a ritual cleansing of its fears. Don’t push back against the community and defend yourself. Conversation is good, though! If you are passionate about your event’s purpose you can find solutions. Dark Mofo’s biggest risk now is not being risky. Dispersal depends on collaboration and the strength of your idea: how it speaks to the community (its values) and speaks of the local environment (that rugged essence of the Australian landscape that is unique in the world). Tell that story in a compelling way. Work to a five-year vision. Video by CMCRocks - celebrating 10 years! CMCRocks is a case study of how a destination can lose a major event. The Hunter Valley decided they would enforce a minimum four-night stay at $390 per night, which the target market couldn’t afford. In addition, the RTO in three years never had a meeting with the festival. So CMCRocks moved the event to Ipswich where they are working with a positive proactive council that makes things easy for them and works with them. In years two and three at Ipswich the festival discovered they needed more space so Council found it for them. A destination needs to be willing to cooperate if they want the benefits of events. Well-known destinations attract events, but smaller, more remote destinations are now being placed on the map as a result of events e.g. Birdsville Big Red Bash! Big gestures - think big! If you were at the DestinationQ Events conference, what were your top take aways? What stood out for you that we missed? What was your most inspiring experience at a festival?